Per group description: This is a grassroots campaign to raise awareness about Lyme disease and other vector-borne illnesses. Our goal is to educate healthcare practitioners and politicians alike by sending them so many informative letters and articles that they can’t help but take notice. Let’s do it! 1. Decide if you’re going to write a letter or choose an article, and try to give yourself a “due date,” so getting it done is a solid priority. If you’d rather send an article, we also have links to articles in the files section that you can use or you can find an article you like on your own. 2. The names and addresses of our 4 current recipients are always pinned to the top of the group page. Once you’ve got your letter written, please go there to get the addresses of who we’re mailing.Everyone mails the same four doctors to ensure that they get so many letters that they can’t continue to deny the existence of chronic Lyme disease across the country. We post four new names on the 15th and 30th of each month. 4. Post who you’ve mailed your letter to (hopefully all four of our current recipients) and please mention which state you reside in, so we count you for that state. 5. You’re done! Relax until the next mailing. Q: What is the goal of this campaign? A: Our goal is to raise awareness about Lyme disease and other tick-borne illnesses by sending high volumes of letters to our recipients so that they cannot continue to ignore us. There is power in numbers and there are so many of us! If we work together, we can bring about some important and much-needed change. As the campaign grows, we expect the media to pick up the story of what we’re doing. One of our members said a reporter in CT is already talking about doing a story on us. We are also working on putting our stories into a book, so if you’d like your story to be part of the book, let us know. Q: If I’m currently too sick to participate, do I need to leave the group? A: While we try to make this process as simple as possible on all participants, including providing letters you can use and mailing packets to you if you don’t have a printer, in order to encourage mailing twice a month, we understand what it is to be so sick that you can’t even lift your head off the pillow (been there, done that). You are welcome in this group regardless of whether you’re currently able to participate or not! You never know what kind of connection you might make or even how your presence might encourage someone else to mail. So, no, please do not leave the group just because you’re currently unable to actively mail your letter/article. Q: I see that you’re mailing recipients 13-16. Can I just jump in? Where are the earlier recipients? A: Yes, please jump in. This is an ongoing campaign, so start where you are. It’s okay. If you’re revved up and want to mail as many people as possible, we do also have a file of everyone we’ve mailed to date. You can go to that file–Whom We’ve Mailed–and send to all the recipients on the list, if you want. Q: I was mailing but then fell behind. I’m overwhelmed. What do I do? A: Everyone in this group is busy and the majority of us are sick to boot. It’s okay to fall behind and it’s not necessary to that you make up for every recipient you’ve missed. When you’re ready, just join back in with our current recipients who are always pinned to the top of the group page. Q: I’m not sick, but my friend is. Can I still participate? A: Absolutely! ANYONE can participate–you do not need to be sick yourself. Our goal is to raise awareness about Lyme disease, and the more active participants we have, the bigger impact we can make. 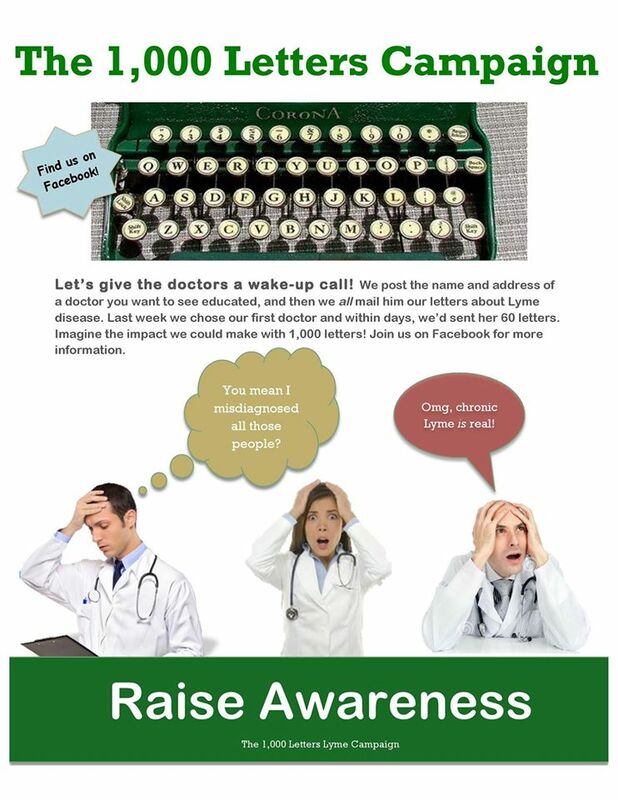 Q: Can I share this campaign on my FB page or with my local Lyme support group? A: By all means, share it wide and far! Our goal is to raise awareness about Lyme disease, and the more active participants we have, the bigger impact we can make. Q: I don’t have access to a printer. Should I hand-write my letters? A: While there’s nothing wrong with a handwritten letter, writing 8 of them per month will get old quickly. Instead, we have members in the group who have offered to print and mail packets of letters to those who can’t print them on their own. Q: Can’t we just email or fax our letters? A: We could but we don’t believe they will make the same impact. An email or a fax (most are digital these days) is invisible except to the one person who receives it. The recipient can then simply quietly delete it. A letter, on the other hand, has to be handled and opened, even if it ultimately gets thrown out. And if the postman walks in with 23 letters on the same day, he or she might comment on it and other office members may take note, see the letters as well and ask what they’re about, thereby generating a discussion about Lyme disease. However, we haveconsidered providing fax numbers to our members who reside in other countries, so that they can participate as well. Q: Where do you get the names of our recipients? A: Currently, group members submit the names of doctors they’d like to see educated, but we also plan to mail the media, politicians and others. We also periodically engage in “bonus mailings.” For instance, right now we’re mailing the post office to request a Lyme disease awareness postage stamp. If you’d like to add the name of someone to be mailed [join group or use comment section below to request contact information and options]. Please be sure to confirm the mailing address of anyone you add to our sheet by calling the office directly and asking for the full mailing address for sending Dr. X a card.Please do not look on the Internet as a means of confirming the address as the information there is sometimes outdated. The office itself can tell you if the mailing address differs from the office address. Also, sometimes doctors change practices or retire, and sometimes there’s a simple building name or suite number that needs to be included when mailing.